Tomorrow morning at dawn I fly to Byzantium with my daughter Tali for a couple of days in the great city. I always had in mind that I’d travel there by train, as I wanted to feel each hill and bump of the earthly connection between London and Istanbul… but also to allow for some time-travelling between the world of now and the world of then which Constantinople represents for me. It takes three days and several hundred pounds to go by train, though, so BA flight 678 it is. I’ve wanted to go there since I was 12. That’s when I first read about the city and got bewitched by it in Henry Treece’s brilliant A Viking Saga, in which the Viking heroes end up in Miklagard – how many names can one city have? But since then, I’ve grown to love Byzantium because Eastern Orthodoxy fed me spiritually for years, throughout the 1990s and into the 2000s. I loved and drew on the alluring mysticism of icons and Eastern liturgy, and Byzantium was the geographical centre of that world. 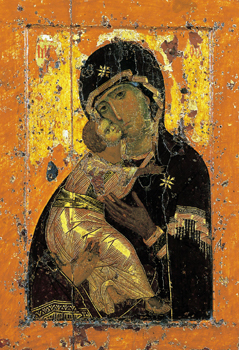 It was there that one of the most beautiful icons of all, the Virgin of Vladimir (seen above), was created and then sent into pagan Russia to help form Russian Orthodox spirituality. I’m looking forward to standing in Hagia Sophia, the Church of the Holy Wisdom, and paying my respects. The church, built in the faraway 6th century, is more than half a millennium older than Chartres Cathedral. But there’s also a smaller church near the city walls with a fresco of the resurrection which I’m anticipating will be a demanding spiritual encounter. Byzantium is a place of meeting and conflict between Christianity and Islam – just the conflicting names of the place tell their own story. Someone today on Twitter told me, ‘Don’t call it Constantinople, the Turks get very pissy about that.’ So I’m hoping also to get a better understanding of this place where the tectonic plates of faith get frictive with each other.